Digital pathology technology is advancing at a rapid pace offering solutions to the increasing need for pathology services. In concert, initiatives utilizing this technology are becoming more and more common to improve accessibility to pathology services worldwide. The following timeline offers some highlights of the use of digital pathology at the international level in the last 25 years. Also in 2002: The United States’ worldwide Military Health Care System (MHCS) used robotic microscopy to perform remote intra-operative consultations between small remote hospitals and Heidelberg Army Hospital in Germany, Walter Reed Army Medical Center and the Armed Forces Institute of Pathology, both of the latter in Washington, DC. 2004: University Health Network (UHN), an academic medical center in Toronto comprised of three sites, began using robotic microscopy in a dynamic server-client system to perform frozen sections in the absence of an on-site pathologist. As these networks continue to expand, scalability becomes a key factor in providing pathology support whether on a local or international basis. Early networks communicated via dedicated lines between an expert center and the remote hospitals and laboratories it supported. These Virtual Private Network (VPN) connections still serve smaller networks well. Other configurations have been developed to support more complex networks. Hub and spoke models allow multiple sites to connect to an expert center. Pathologists at the expert center provide subspecialty support and remote assistance for frozen sections and multidisciplinary team meetings at the other facilities within the network. Mesh networks expand communications between all sites within a network, improving user access, image rendering and turn-around-time of reporting. Experts can be located at any site, and they are accessible to all users. Sub-specialties experiencing severe personnel shortages such as pediatric and neuro-pathology can collaborate with their colleagues no matter where they are located. 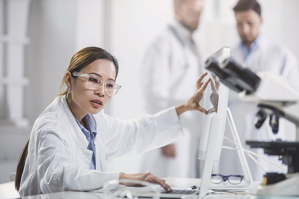 With the global shortage of pathologists, digital pathology technology facilitates collaboration, sharing and consultation on difficult cases with subspecialty experts worldwide. In addition, pathologists can benefit by the sharing of best practices and using their digital pathology platform for education and research at an international level. Stay tuned for Part 4: Challenges to providing a digital pathology service at an international level. Fleming K, Naidoo M, Wilson M, Flanigan J, Horton S, Kuti M, Looi LM, Price C, Ru K, Ghafur A, Wang J, Lago N. An Essential Pathology Package for Low- and Middle-Income Countries.American Journal of Clinical Pathology. 2017; 147 (1): 15-32. 2, 3, 5, 6, 10, 14. Park S, Parwani AV, Aller RD, Banach L, Becich MJ, Borkenfeld S, Carter AB, Friedman BA, Rojo MG, Georgiou A, Kayser G, Kayser K, Legg M, Naugler C, Sawai T, Weiner H, Winsten D, Pantanowitz L. The history of pathology informatics: A global perspective. Journal of Pathology Informatics. May 30, 2013; 4:7. 7, 15. Kayser K, Borkenfeld S, Djenouni A, Kayser G. History and structures of telecommunication in pathology, focusing on open access platforms. Diagnostic Pathology. 2011; 6:110. Kaplan K, Burgess J, Sandberg G, Myers C, Bigott T, Greenspan R. Use of Robotic Telepathology for Frozen-Section Diagnosis: A Retrospective Trial of a Telepathology System for Intraoperative Consultation. Modern Pathology. 2002; 15(11): 1197–1204. Andrew J Evans, Runjan Chetty , Blaise A Clarke , Sidney Croul , Danny M Ghazarian, Tim-Rasmus Kiehl , Bayardo Perez Ordonez , Suganthi Ilaalagan , Sylvia L Asa. Primary Frozen Section Diagnosis by Robotic Microscopy and Virtual Slide Telepathology: The University Health Network Experience. Human Pathology. 2009; 40, 1070–1081. Tetu B, Evans A. Canadian Licensure for the Use of Digital Pathology for Routine Diagnoses One More Step Toward a New Era of Pathology Practice Without Borders. Archives of Pathology & Laboratory Medicine. March 2014.Vol 138, pp 302-304. 13. Farahani N, Riben M, Evans, AJ Pantanowitz, L. International Telepathology: Promises and Pitfalls. 2016; 83(2-3): 121-6. Epub 2016 Apr 26. Mpunga T, Tapela N, Hedt-Gauthier BL, Milner D, Nshimiyimana I, Muvugabigwi G, Moore M, Shulman DS, Pepoon JR, Shulman LN. Diagnosis of Cancer in Rural Rwanda: Early Outcomes of a Phased Approach to Implement Anatomic Pathology Services in Resource-Limited Settings.American Journal of Clinical Pathology: 2014; 142(4): 541-545.